Australia needs to lift the status of teachers to attract the best and brightest to teaching. The world's top-performing school systems make it a national priority to attract the strongest candidates. Improving teacher selection improves student results. Australia's brightest students are increasingly rejecting teaching. The greatest falls were in the 1980s. But entry standards have slipped further over the past decade. In 2018, only one in four students offered a place in undergraduate teaching based on their Australian Tertiary Admission Rank (ATAR) had an ATAR of 80 or more, compared to one in two across all courses. To stop the decline, New South Wales and Victoria have tightened entry standards. Victoria will increase minimum ATAR requirements from 65 to 70 this year. Federal Labor's shadow education minister Tanya Plibersek wants to make entry to teaching far more competitive by significantly increasing ATAR requirements towards an ATAR of about 80. She has threatened to cap teaching places if universities don't lift entry standards themselves. She says too many high-achieving school students get told not to "waste their ATAR" by going into teaching. The federal minister, Dan Tehan, says better career paths and pay reforms are key to making teaching a more attractive profession. His Parliamentary Inquiry into teaching status will report back soon. Both arguments have merit. Making entry more selective will help lift status, but the low status of teaching is more than an image problem. There also needs to be deeper reforms to the job itself, such as higher pay at the top end, better opportunities for career advancement, and improvements to the professional working environment. These reforms would have dual benefits: they would help attract talented people to teaching, and empower existing teachers to be more effective. Tightening teacher selection can deliver big improvements in student results. 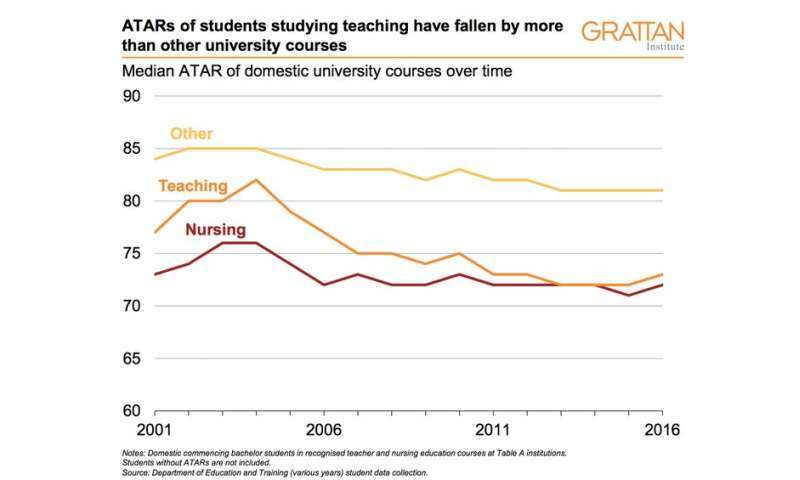 Yet universities tend to have a knee-jerk reaction to proposals to raise ATAR entry standards. For example, earlier this month the President of the Australian Council of Deans of Education, Tania Aspland, claimed "there is no evidence to show that those with higher ATARs become better teachers". But the world's top-performing systems, such as Singapore, Korea and Finland, invest heavily in screening candidates on admission to teaching. Prospective teachers are assessed on their prior academic ability, as well as traits such as dedication to teaching. Singapore even assesses student teacher performance in a real-world classroom trial. Only one in ten students who apply to be teachers in Singapore are accepted. Several rigorous studies find prior academic performance is a good indicator of who will go on to become a great teacher, not just on standardised tests but also according to on-the-job performance reviews. One 2018 multi-country study found countries with teachers who have high academic aptitude get better student maths and literacy results. Yes, some studies find no link between markers of cognitive ability (such as the SAT scores of US teachers) and student results. But on balance, the evidence suggests requiring prospective teachers to have a higher ATAR – along with other predictive factors such as leadership capabilities and dedication to teaching—will increase the likelihood of recruiting more effective teachers. Making entry to teaching more competitive will need to be carefully managed. To ensure diversity in the future workforce, there will need to be adequate alternative pathways for students from a variety of backgrounds or specialist skills. But alternative pathways should not be used as a smokescreen for lowering overall entry standards. Tightening selection into teaching will help make it more prestigious, but lifting the profession's low status requires at least three other reforms. First, lift teacher pay at the top end. Teachers in Australia start on a good salary compared to other graduates, but the pay is too low at the top end. Australia's top teacher salary is 40% higher than the starting salary, well below the OECD average of 80%. To attract high-achievers, the top-end salary needs to be competitive with their options elsewhere. Second, offer better career pathways. The best teachers should have fast-track opportunities that give them responsibility for developing other teachers and driving improvement in their school and beyond. Job descriptions such as this exist on paper, but they don't necessarily happen in practice. Better career options for those passionate about mastering teaching should sit alongside school leadership pathways, so teachers don't have to switch into school management to gain promotion and a pay rise. Third, improve the professional work environment for teachers. Teachers need more opportunities to develop on the job, with meaningful feedback on how to improve their classroom practice. They need more high-quality, tried-and-tested materials – and fewer time-consuming administrative tasks. There are no easy fixes to the entrenched problem of low teacher status in Australia. Making entry to teaching more selective would be a good first step, but deeper reforms to pay, career and the work environment are also necessary.